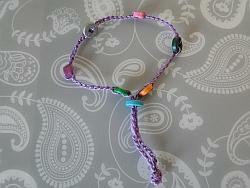 Let's crochet a bead bracelet using chain stitch. 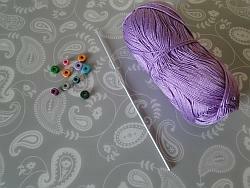 I'll show you how to do it with one of my favorite yarns: mercerized cotton. I love this kind of cotton. It's so smooth and silky, quite firm, too. 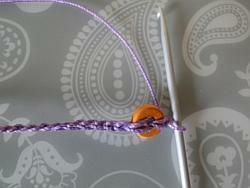 It looks so stylish and gives your crochet a professional looking finish, even if this is your first time using it! 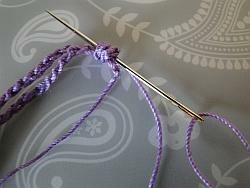 You can use whatever yarn, hook, or selection of beads you want, but you need to check that your hook will fit through the beads you are working with. The cotton I'm using is lace weight - Alize Miss. It's a little heavier than thread weight. You may not have worked with such a fine yarn before, but I think you'll relish the experience! 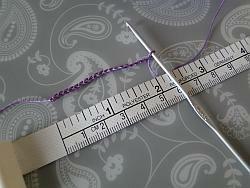 My hook is 2.0 mm - the closest size I can find for US hooks is a 2.25 mm hook which is size B1. 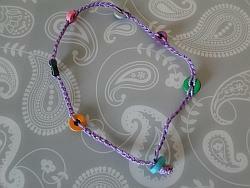 A hook that will fit through the bead holes. 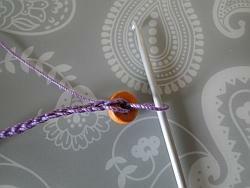 Yarn that works with the hook and that will go through the beads - at the end we will thread the two tail ends through a bead, so you need a bead with a hole big enough to do that! 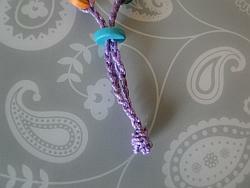 Start with a slip knot. Leave a long tail of about six inches, as this makes things easier to work with at the end. 3. 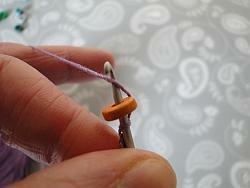 Push the bead down to just above the loop on your hook. 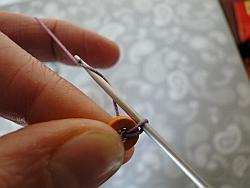 Pull the yarn down through the bead and the stitch on your hook. 5. There! 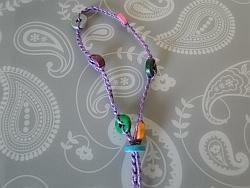 Now you have a chain worked through the bead. 6. 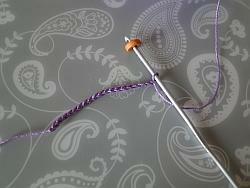 So - yarn round hook. 8. 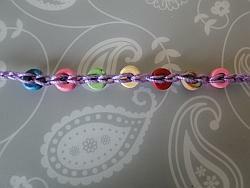 Now you can make a few chain. 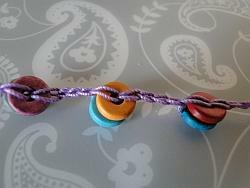 I crocheted about seven chain. 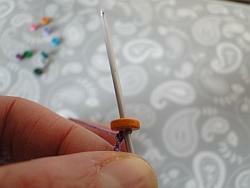 Then repeat steps 2 to 8 to add another bead. 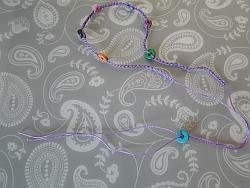 I added six beads altogether, each separated by 7 chain. You can add more, of course! Remember we crocheted two inches of chain at the beginning? 11. End your chain. Don't cut the tail too short! 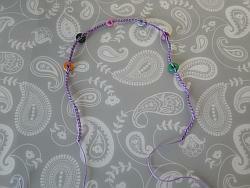 Our beads are threaded and we have plain length of chain at each end plus the tails. 15. 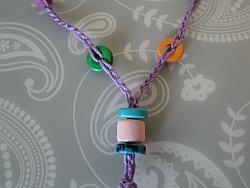 Tie a little knot at the bottom of the two chain ends. 16. 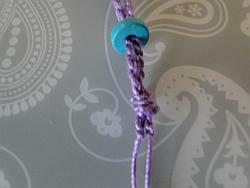 Sew the tails up through the knot to weave them in. Then snip off those long tails! 18. 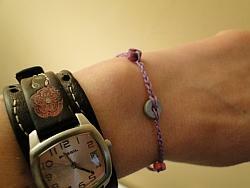 Move the bead down and put your bracelet on. Once you get used to this, you can whip one up in a jiffy! 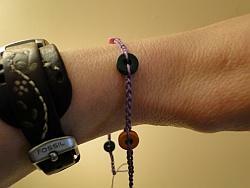 For a very easy bracelet without beads, try the chain stitch bracelet. 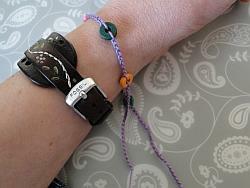 Different effects produce a unique bracelet every time! 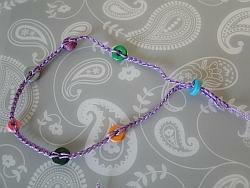 You can use lots of different color beads - or just use one. 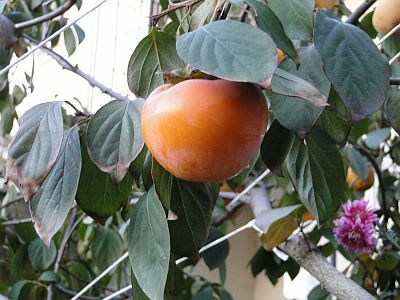 How about green and orange inspired by this Persimmon tree?